UPDATE 1/15/12 – The eBay auction states that it sold for $60,000. This may just look like some rusty old frame, but that old frame actually belonged to a very special car. It was once the backbone for a fire breathing 1951 Allard J2. These cars were hot rods in their day and this one was presumably SCCA raced until a fire left it in this sorry state. The seller has found a few hints of its past, but is now using eBay to try to collect more details or possibly sell it. They are asking $65,000 for what is left of the car here on eBay. The price may seem unreasonable, but after learning a little more, you may reconsider. 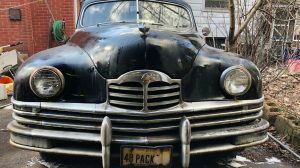 It is hard to learn much about a car’s history if all you have is the frame, but the seller has uncovered a few tips. They believe that the car was originally red and that it was later repainted green. They also found the remnants of an old SCCA sticker on an interior panel which led them to assume that it had been raced. It was discovered in the mid 1970’s on the east coast and they believe that it lost its body to a fire at some point. There is not much left here, but you can make out Allard’s unique independent suspension design and a few other little details that do confirm that this is indeed an Allard. This old racer is going to need a drive train, interior, exterior panels, and just about everything else. There are a few shops that have the resources to take on a project like this, but it is going to cost you. Would it be worth it though? Well, they want $65k for the frame and the restoration cost will be substantially more. These beasts can sell for anywhere from $150k to $300k. So if you think you can get the job done for less than $100k then you could actually be above water even after dropping so much on the chassis. If there is any significant race history here, this car could even be worth substantially more. Here is what you will end up with. A brute of a roadster ready to dominate at any vintage race event. It is hard to believe that the shabby frame above was onced attached to a body that looked like this. The Allard Register has a little more information about these machines and why they were so great. If the aforementioned project looks to complicated for you, maybe a new J2 MKII would be more to your liking. It would require less elbow grease, but it would never have the history of an original Allard. I’ll never forget an early 70’s issue of Automobile Quarterly had a wonderfully funny story about an Allard J2. It seemed such a crude machine. Sydney Allard was a low budget genius. He didn’t make many cars but those he made did some marvelous things. Winning the Monte Carlo rally, beating Ferraris and such in road races. The J2’s were shipped over here w/o engines to help with export laws in the UK at the time. 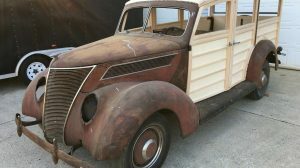 Usually they got originally flathead Fords like he used on his earlier cars in England, But most got early ovh Caddies or Chryslers. As you can see at the vintage races, these are ILL handling beasts with their split beam front axles, they were, however blessed with more Hp than most with the usual cad or Chrysler. I do not claim to know anything about the Allards, but I swear I don’t see any king pins or spindles on that front axle. I’m probably seeing things tonite, but my gear head mentality got the better of me. I even zoomed way in on the pic. Also were all allards rt drive, cause the frame it left hand drive ???????? I have some scraps of red paint chips that might possibly have come off of the original body of this same car, maybe. Bidding starts at 10 grand. The new ones are nice and much safer. One of the distinguishing marks of the original Foxy was the unique front suspension. It was simply a split beam axle. Call it a swing axle. Bugatti had toyed with the idea. Allard use it as a cheap out. The problem was he probably would have been better off using an old fashioned beam axle. If you look at the old pictures the swing axle used to assume some weird wonderful and extremely scary wheel attitudes. Making handling on rough road courses somewhat unpredictable. This combined with the light weight, Caddy horsepower and torque and skinny tires made them fast but an adventure to drive. 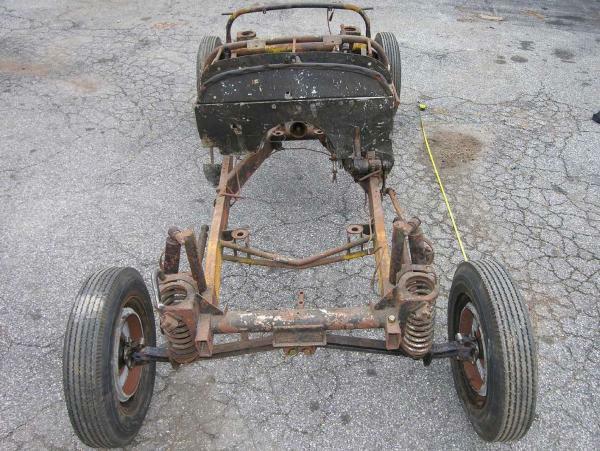 Really, there is lots of potential here….. he has an Allard chassis (with number) and an unknown race history. (don’t underestimate the value of race history)Let’s hope some of the people viewing this auction can contribute clues to the history. With only 90 made I would bet the history of this car could be narrowed down relatively quickly. Lots of documentation exist regarding early SCCA events. I was 7 when Dad took the family to the 1952 Watkins Glen GP. Erwin Goldschmidt and his Allard went wide coming into town and clipped a 7 year old kid on the curb (crowd control was non existent) and killed him. Dad was working race comunications on the track just before the railroad crossing and was distraught until he found my mom and me. We never went back until 1963. Erwin raced with whitewall tires. General Curtiss LeMay went a long way toward saving US road racing by opening up air bases for racing when all the street circuits were closed. As for Allards, the later J2X had a different front suspension that was much improved over the split axle. There are so many better cars you could get for the same money as buying and completing this one. Brad, I’m afraid you miss the point. Restoring a car is not about getting something as good as a newer car but preserving history. I can’t see how you can prove a frame was used in a race. What did they do, register the frame and not the car when they raced back then? I agree with Brad. I would rather spend that kind of money on something that at least gave me more than just a frame! BUT it’s an uncommon vintage car that actually resembles what was running back when it was new..Back then racing cars were for racing not show cars and investments and usually were less than pristine and had been modified with at least an aftermarket coil and interesting oil catch cans, different seats etc! I think it should be cleaned up and used as a museum piece next to a complete original. I would assume that the frame number can lead to a trail of ownership hence to a possible racing history. Many historic cars have been restored from less. wheres the chassis number to prove the deal? get real guys, this could be any old jalopy. Hey Allardman, someone else built a “jalopy” with Allard’s distinct suspension? 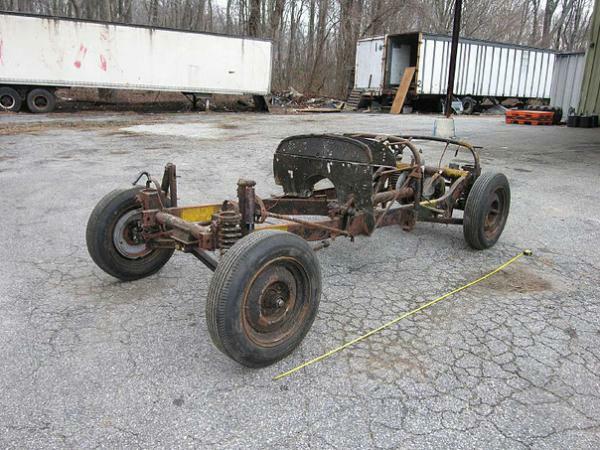 The chassis has a great deal missing such as front brakes, half shafts on the rear and most of the steering linkage!! Most can be found or can be made without much trouble but It will cost dearly. The rest will cost more than buying a complete car. As you say, the bits are easily available, Syd was a Fords Dealer so it was 95% ford and there’re lots of Ford bit floggers here and everywhere! If this is a HOBBY one SHOULD be willing to restore themselves! To me that’s the beauty of most Brit cars, they were built by hand so can so be rebuilt! If you’re too@#$% lazy/stupid to learn how to work on these lumps stick to Toyotas, they’re faster and will drive rings around these beloved old crocks! Chris,It was Fred Wacker, not Erwin Goldschmidt that struck and killed the young boy at the Watkins Glen Grand Prix. Thanks Andy. Watkins Glen had a nice historical Grand Prix museum, but I thought I heard it burned with a lot of great pictures. Wasn’t Fred Wacker an early big shot in the SCCA along with Jim Kimberly? Sidney Allard reminds me of Ak Miller and Max Balchowsky as guys who built neat stuff with almost no money. 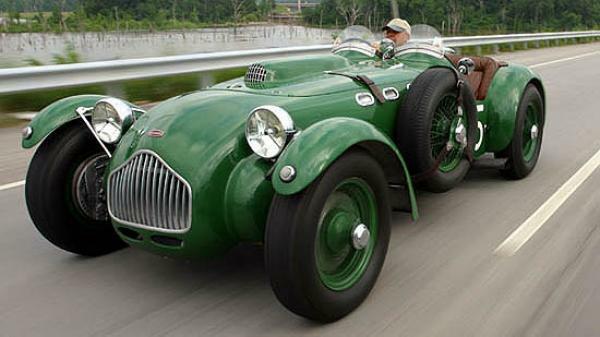 If nothing else, an Allard J2 looks like a race car. Chris,The racing museum at Watkins Glen is still there. I believe it goes under the name of the National Motorsports Museum, or something like that.Fred Wacker was president of the SCCA in the early 50’s. He never raced again after hitting the young boy at Watkins Glen.I agree with you re. Allards. I own two. As you may remember such crowd control accidents happened in the 50’s. Best known are 1955 at Lemans, and Alfonso de Portago at the Mille in 1957. J. Pickett, I respect and enjoy your knowledge of racing history, specially liked the comment “adventure to drive”….I believe all 50’s and 60’s sports cars were an adventure to drive!……. Smooth track, Look at the old pictures like Watkins Glen street racing and it will be obvious that when things got uneven those from wheels would flap mightily and acceleration vastly alter the camber. Kind of like the rear end on my 59 beetle, or my present Spitfire. Thats true. When designers started looking to move away from a beam front axle, where a bump on one side upsets the whole axle, a split beam was a simple solution. The problem is the small radius of the arc through which the wheel moves, which plays havoc with the tyres contact patch with the black top. Allard racers nowadays restrict the movement of the front end with stiffer springs, improve the damping, and some reduce the camber. Most racing Allards have a lowered ride height as well. As you rightly point out, this is fine on a smooth track, which most road circuits are nowadays. My J2X is a pretty rough ride on normal back roads, but I put up with that for good handling at the circuit. Allard wasn’t alone. Ettore Bugatti loved his axles so much that when independent frt susp. became nec. he did the same thing Allard did. Ha ha! I dont think dear old Sydney quite had Ettore’s artistic eye! Not even sure you should mention them on the page!! I think all Bugatti designs had a beam axle (albeit a beautifully light one) except the four wheel drive car which obviously could’nt. That was a bit of a failure. But I saw one hill-climbing a few years ago, and it was the quickest car off the line by some margin. To get back on thread, has this chassis sold? Does anyone know how much it made if it has? According to Ralph Stein, Bugatti so loved his forged hollow tubular axles he wouldn’t let them be replace with irs, but once approved splitting that beautiful axle like Allard did. Allardman, Didn’t the original J2X use a Bugatti body? Sydney may not have had Bugatti’s eye, but he knew how to appreciate a good looking car…And that right there is a reason to put both names on the same page. Keith, your comment on the original J2X is a matter of history, I believe you are not right. Your opinion, of which you seem remarkably sure, of Sidney Allards artistic eye, is surely a subjective one. You may or may not share that with other folk. My own opinion is that Sidney may have appreciated a good looking car, but then not many of those of his own creation. Incidentally, he did not style his companies cars. 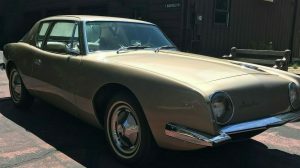 I suspect, however, that some Allard body styling is a victim of fashion, and looks dated to the modern eye, especially their saloons.I prefer the J2 to the J2x, which to my eye is very ugly, but my favorite by some margin is the Le Mans J2X. Its not pretty, but it has presence. Thats why I bought one !! It’s obvious that the J2 was styled by function, this was a race on weekend, drive if you care to on weekdays car. Obviously a minimalist machine, function. I am not quite sure how asking a question makes me seem remarkably sure of myself – me thinks you spend too much time with sarcastic individuals. You are quite likely correct about the J2X not being based on a Bugatti, as I found the following quote from John Allard’s A Brief History – “The first car to be officially called an Allard was the result of a marriage of an English Ford V-8 Coupe and a Grand Prix Bugatti body.” He is referring to the CLK5, and not the J2X. Thank you for setting me straight. I’ve read that Bugatti had another very good reason for splitting the front solid axle. One of the problems Bugatti was having with the later models is that wheel tramp on a solid axle carried over to the other wheel making handling iffy at the wrong time. By splitting the front axle, the problem was resolved. Ford had a solution for the camber change when they dropped the solid axle in their pickup trucks. Remember the “Twin I Beam” front suspension. 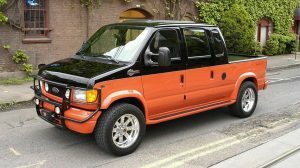 Lets just say it wasn’t one of Fords’ better ideas. The problem Bugatti cured wasn’t axle tramp, but shimmy. The split front axle on the Allard, was because it was for road racing, a track which were generally more even and consistent solid axles weren’t as much an issue, ie indy roadsters had them till John Cooper came over in 63. Ford Truck had problems with Twin I beam but it still cheaply met the requirements of their then mostly business users. Heavy Duty. Until just early eighties at least most dealers had a dedicated truck dept. who handled those things because there were so many technical options. When I sold Chevys all truck customers were referred to him. Even Suburbans and early Blazers were TRUCKS.